As with the "Customized Trucks" article, I'm going to take some time and space to talk about an idiotic trend I'm seeing amung my fellow young people. We see them every day. Some Civic or Accord, perhaps an Eclipse. The owner has done something stupid and ruined an otherwise perfectly good car. Don't get me wrong with this article, I love Hondas. My family owns two and they are great, reliable, efficent transportation. That's it. They are by no means race cars. That's what burns me up when I see the arrogance of these ricers who think that the car they built with Mommy and Daddy's money and the Civic DX they got for their 16th birthday it the best car around. What are some rice characteristics? 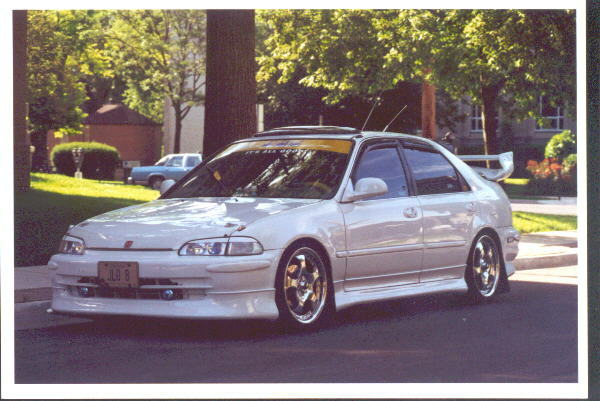 1)*Rice tip* --Have you ever seen some Honda with what appears to be a HUGE exaust pipe? I'm sure you've heard the majestic buzz of one. Riceboys say that the tip helps to get the exaust out faster, but that idiotic. Unless the exaust manifold piping is the diamater of the tip, the same ammount of exaust escapes. And, unknown to ricers, it sounds AWFUL! They DO NOT sound like racers, they sound like 4-bangers with holes in the muffler, or maybe they're just farting. 2)*Wings and Spoilers*-- Ricers like to make their cars look fast by putting a big wing on the decklid of their car's trunk. Now on some cars, a wing actually works. What the wing is designed to do in those situations it to apply downforce to the back wheels. The spoiler was invented for REAR wheel drive cars, so down force on the rear wheels is helpful in those situations. 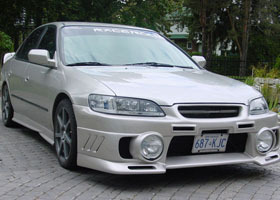 Now Hondas are front wheel drive so even if the spoiler did apply downforce it is applied to the wrong side of the car. Please not that most rice wings are bargain-basement, one-size-fits-all Pep Boys models that do nothing but slow the car down due to the aerodynamic drag they create. 3)*Stickers*-- Ricers like to think that they have sponsors or that they are members of "Team Sport Compact Import" or some other foolishness. Thus they are compelled to slather their cars with innane stickers and banners advirtizing the mods that their cars do not possess. 4)*Lowering*-- It is true that slight suspension changes can improve the aerodynamic qualities of a vehicle. But ricers like to take it a little far. Many of them simply cut their springs to achive the look of a lowered suspension. That is of course, bad for the car, but the ricers don't care. If they ruin this one, Mommy and Daddy will buy a new one. 5)*Clear taillight lenses*-- Ricers like to maker their car look unique by putting clear lenses on their car's taillights. Why? I can't even explain it. It's just stupid. Look at this ugly Accord. Note the bizzarre and tasteless body kit. Dumb-looking air dam and the useless and annoying fog lamps. You can also see that some type of suspension work has been done, but I don't know if it was done correctly. You can also see the dumb aftermarket wheels and a banner of some kind on the the windshield. 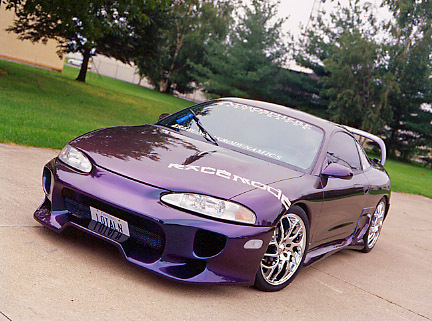 Importent points of intrest on this ricey Eagle Talon. First you have the dumb spoiler, lowered suspension, cheap air-dam, and idiotic wheels. Also note the $0 single-wiper mod that adds so much power. Now look at the hood. Are those fake Japanese symbols, on an American car? Poor riceboy, Mommy and Daddy didn't get him the Japanese car he wanted, I guess. This tasteful piece of automotive beauty requires no summary. Just look at it in horror, and try to believe that someone out there thinks that it's fast.